AMC Mecanocaucho® BSB engine anti vibration mounts are anti vibration elements which work the rubber in shear and compression with an optimal ratio of stiffness and horizontal stability. 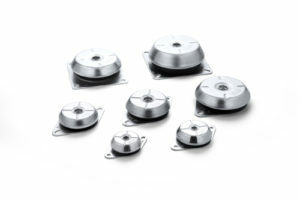 These engine mounts are really applicable when stability is a priority in an anti vibration suspension. In applications where the degree of isolation is the priority we thoroughly recommend the use of BSB captive mount. Click here for the full BSB product range.